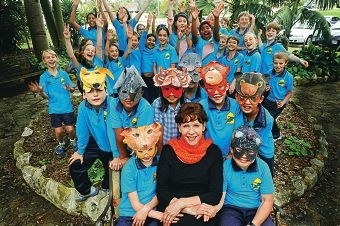 Churchlands Primary School Kids Who Give WA Program organiser and Year 2 teacher Sheree Samsa with Animal Club students. Launched earlier this year, Kids Who Give WA encourages and rewards the efforts of socially minded young people. ‘Over the past six months, it has been a privilege to speak to more than 10,000 students across Western Australia on the importance of ‘giving back’ to those in need,’ Mrs McCusker said. Churchlands PS teacher Sheree Samsa said the trip to Government House was not just about sharing their own projects but also appreciating the efforts of other schools. ‘It was an opportunity to showcase and we got to listen to what other schools were doing,’ Mrs Samsa said. Churchlands projects include the Green Team’s weekend of tree planting in Quairading and the Animal Club’s adoption of three orang-utans. Primary schools and youth groups can sign up at kidswhogivewa.com.au. The Kids Who Give WA awards on October 24 will include the distribution of $50,000 in cash prizes divided between the winners and finalists across eight major and several minor categories.